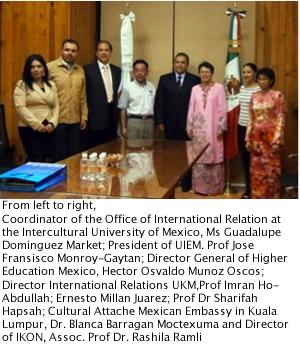 TOLUCA, MEXICO, 18 May 2012 – The National University of Malaysia (UKM) Global Student Mobility Partnership programme has so impressed the Universidad Intercultural de Estado Mexico (UIEM) that it was adopting it to promote understanding of Mexico’s indigenous communities. UIEM will this Aug start its first international Student Mobility Partnership on Cultural Diversity modeled and branded along the lines of the UKM Global Student Mobility Partnership programme. The university had sent four of its students to take part in the UKM-Global Student Mobility Partnership in 2011 which was started to promote intercultural understanding and friendship. UIEM’s Rector, Prof Jose Francisco Monroy-Gaytan invited Vice-Chancellor, Prof Tan Sri Dr Sharifah Syed Hasan Shahabudin for a working visit to UIEM to review and provide input as well as validate the programme designed by its lecturers. UKM has signed an MoU with UIEM in 2011. The UIEM programme will also carry the UKM crest alongside UIEM’s and the crest of Mexico which is sponsoring the programme. UIEM will also continue to sponsor four students to the 4th edition of UKM’s Global Student Mobility this June 2012 – the second time UIEM will be participating in the programme since 2011. UKM will reciprocate by sending four UKM students to the Mexican programme.